Students use "magic" to navigate around the hundred board. This activity introduces horizontal arrows which mean move one square in the direction the arrow points and vertical arrows which mean move up or down one row in the direction the arrow points. 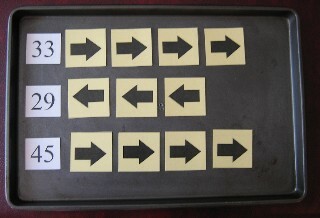 These activities support students as they develop understanding of powerful number patterns in the hundred board: (1) moving across or back one space means adding or subtracting one from the starting number; (2) moving up or down one row means adding or subtracting ten from the starting number; (3) combining a series of arrows is the same as adding or subtracting a two-digit number. These activities build upon the understanding of counting on and counting back by one. The arrow magic routines challenge students to develop strategies for counting on and back by ten. Hundred Board for each student. Place each chart in a clear sleeve protector so that students can use dry erase markers to circle starting and ending numbers. They can also "hop" from number to number to mark each arrow on the path making it easier for the teacher to see what strategy students are using. 8-10 arrows: copy arrows from Hundred Board Magic packet (pages 12-13) onto card stock then laminate and affix magnetic tape for use on magnetic chalkboards. If the chalkboard is not magnetic, use tape on the back of the arrows or use a pocket chart to display arrows. Horizontal Arrows: The teacher introduces a horizontal arrow which means to move one space in the direction it points (forward or backward). Students will quickly see that this represents adding or subtracting one from the starting number. Next, the teacher identifies a starting number. The teacher creates a string of these horizontal arrows and challenges students to figure out where they end up after following each arrow. The teacher asks students to give a number sentence for the "arrow magic" sentence. The teacher should lead the class in several more examples and end with some mixed examples of arrows pointing in both directions. Vertical Arrows:Next the teacher introduces the vertical arrow pointed down and challenges students to decode the meaning of this hundred board move. If students are familiar with the hundred board, they should recognize this as a move to the number below the starting number. Practice several of these simple examples to reinforce this counting on by ten. Circulate around the room to informally assess which students are counting on by ten and which students are still counting each of the ten squares. Make a note of these student names so that you can provide additional individual or small-group instruction and practice so that students develop an understanding of the counting by ten strategy. Now introduce the vertical arrow pointing up and ask students to explain what this arrow means, Again, practice several examples to be certain that students are clear on the meaning. Finally, introduce a series of down, up or a combination of up and down arrows and challenge students to identify the ending number. Number Grid Game: This game is introduced in first grade to help students develop the concept of counting on by ten. The game is especially appropriate for students who are still counting on by ones and not moving to the counting on by tens strategy. It is also a great math center game that all students will enjoy. Differentiate the game by varying the ending number or by providing extended number grids for more capable students. Combining Horizontal and Vertical Arrows: Introduce these combinations only when students are secure with counting on by ten. After students have successfully solved several combinations problems, challenge them to figure out what two-digit number was added to the starting number. Ask students to explain how they figured out that number and challenge them to explain how the arrows are a shortcut or code for this number. Provide lots of practice in decoding combinations and writing the appropriate number sentence. 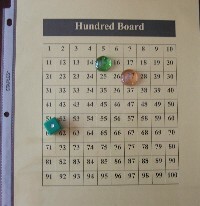 Math Center Activities: Hundred Board Magic lends itself to differentiated center work. 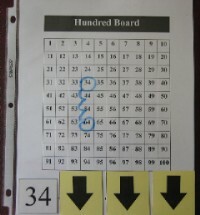 Provide copies of the hundred chart in sleeve protectors and bags of arrows. Differentiate the activity levels by varying the types and number of arrows students may use in their arrow strings. Students can work as partners to create an arrow string, identify the starting number, then solve and record the number sentence. The teacher may also provide index cards so that students can create arrow string problems for classmates to solve. If your students enjoyed the Swiper activities, they'll be pleased to meet Rocky Raccoon who also steals numbers from the hundred board. Rocky sometimes makes puzzles of the hundred board and he drops some of the pieces as he leaves. Students will love the challenge of writing in the missing numbers to outsmart Rocky Raccoon. They will practice identifying and using the number patterns in the 100 board. They will also practice writing 2-digit numbers as they fill in the missing numbers. Students can make their own hundred board puzzles by cutting up a hundred board. 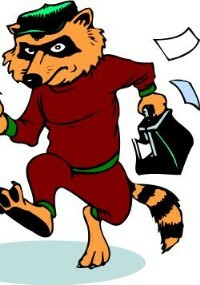 Students can also be challenged to create their own Swiper or Rocky Raccoon character who steals numbers. They can create puzzles for classmates to solve. Students can create puzzle pieces with missing numbers for classmates to solve by using hundred board patterns to write the correct numbers in the puzzle piece.